Click to go to the Steam page! Steam achievements are now implemented in the game! 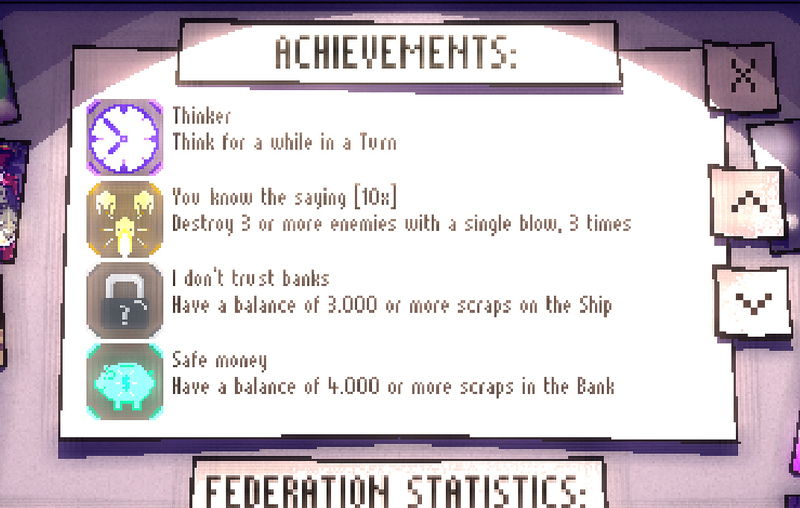 As well as an internal system of achievements (which are the same as those of Steam). There are 51 achievements made based on players’ requests and observations of how the game is played. The internal system also keeps track of the number of times something needs to be done to unlock a achievement, and continues to do so even if the achievement has already been unlocked! Some achievements will quickly unlock for those who already played the game: Overall, all achievements based on factors already recorded before (such as the number of defeated Drones or unlocked ships) will unlock quickly. Others needed to be played normally. – One to score the Reputation points (which is the score of the game), with a different list for each difficulty mode. – And one to record Run time (the lower, the higher the position in the list), also with a different list for each difficulty mode. Reputation rankings are updated every time a pilot dies or beats a dragon mothership. Those based on the time of the Run only update when a pilot beats a mothership. You can track the current Run time in the options menu, which also pauses the time. Also improved were the way the Reputation of the last MIA pilots is shown and a new list has been added with the times of each Run (successful or not). The current implementation of the plugin we use does not allow integration of online Steam Leaderboards in-game, but you can check out these on the game’s Community page! Updated COMBO system: Now “Reputation Combos” remain from Jump to Jump and only resets when exiting OUT of the Jump and/or taking a Hit (with shield accessories or not). This increases the focus of the game in planning and executing each jump when attempting to beat other players’ Points / Reputation. And it makes it more rewarding not be hit. – Improved scanner making the “Danger” text red. – Made some minor balance changes to enemies creation. – Fixed some typos (thanks for the reports!). Thanks and I hope you like the update!